I don't quite know what to say about this one. I don't want to sound negative, but at the same time I feel I need to be honest. I've been a fan of Sherrilyn's work from the very start; her Dark Hunter Series is one of my all-time favorites. 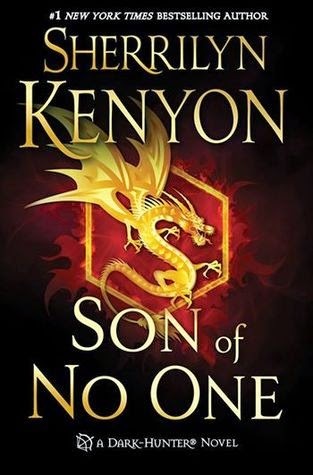 However, when it comes to Son of No One, I felt as if I was reading a book written by someone else (at least in part). On top of that, there were shockingly careless editing errors (missing periods, mis-spelled words) and, no matter how hard I tried to look for it, I didn't pick up the "classic" SLK "tone" that underlies all of her work. It was simply missing. Non-existant. I felt as if I was reading a novel written by a ghost writer and worse, re-reading the same thing over and over - it's one thing to repeat something, assuring the reader of the impact you want to make, but this was nothing but...filler. Not to be repetitive myself, but I have to emphasize this because it is so unlike SLK - The writing was, at times, so repetitive I started to get angry. We all know how (he) feels about himself and that (he) has trust issues, thank you. There were times I felt as if I was reading someone else's work and the story actually *gasp* lagged, which I've never once said about a SLK Novel. Never. Then we get to the specifics of the story - The "instant love" got me above all. Who, In their right mind, drops into a hellish environment, having been ignorant of it to begin with, meets a tortured demi-God and falls in love? BAM! Nope. Where's the meat of the story? The character-building, the escalating storyline? It all felt absent in this book - as evidence by the space-filler I discussed earlier. And this may seem a minuscule concern, but, especially considering the next DH Novel (dragon character), I have to bring it up... Who the heck made the final design decision on this cover? This is not to say that it wasn't beautiful, because like all SLK Novels, the cover was beautifully designed, but a dragon? Seriously? I felt as if the cover had been designed for the NEXT DH Novel and they decided to slap it on this one. In this Novel, the dragon only made a BRIEF appearance. Usually, her covers are completely in-sync with the context of the story; this cover had me thinking one thing, yet reading an all together different one. As if I wasn't aggravated enough by all of this, there was something that topped it all; there is NOTHING I dislike more than a publisher who attempts to make a book APPEAR longer than it is in actuality, by shrinking margins (disgustingly so) and upping the font to "If I were half-blind I could read it" status. Heck, I wear glasses and the font was so large, I had to remove them to read it! Take the issues with the (filler) story, careless editing errors, a cover that confused the hell out of me and then add in the almost 3" margins with 18pt font and I was one unhappy camper! Readers are not dumb - if you write a (shorter) story, then advertise it as such. Don't shrink down the margins and increase the font simply to keep the page count up, and therefor the selling price. It just pisses readers off, as it did me. When I pick up a thick book, I expect (especially with SLK) to have hours of quality reading ahead, making it more than worth the money. As per her normal, I expected this with Son of No One - only to be left feeling cheated in the end. In summary, taken as a whole, I was extremely disappointed in Son of No One. When I received the book I was giddy with anticipation; hours later, I slammed it shut in frustration. Sadly, this is the FIRST SLK Novel that will NOT make it on my favorites shelf. Here's to hoping that the next Dark Hunter Novel will be back on track with what we have all come to expect from Sherrilyn Kenyon!